It's official! The Philadelphia Phillies have signed first baseman Carlos Santana to a three-year contract, the team announced Wednesday. The deal includes a club option for 2021. The 31-year-old switch-hitter hit .259 with 37 doubles, 23 home runs, 79 RBI, 88 walks, a .363 on-base percentage and an .818 OPS last season in 154 games for the Cleveland Indians. Santana was the 2017 Wilson Defensive Player of the Year at first base and a Gold Glove finalist at the position. 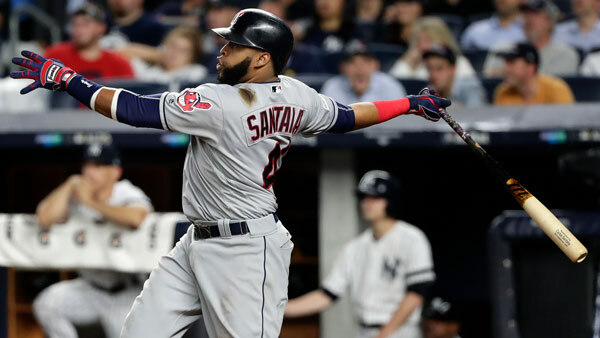 Over the past seven seasons, Santana has appeared in the fifth-most games (1,070) among all major league players and leads all American League players in total walks (689) over that span. He has finished in the top five in the AL in walks in each of those seven years. Additionally, in two of the last five seasons (2013 & 2016), Santana has ranked among the top 10 AL players in on-base percentage. Santana is a native of the Dominican Republic. He was originally signed as an amateur free agent by the Los Angeles Dodgers before being traded to the Indians in July of 2008. In 1,116 major league games - all with the Indians - Santana has batted .249 with 236 doubles, 174 home runs, 587 RBI, 726 walks and an .810 OPS.